Years after the Great Recession, Michigan still has a large contingent of people and families considered part of the working poor. Consider a somewhat typical young family in Michigan: two parents, with a kid in preschool and a baby at home. To make ends meet, it’s practically mandatory that both parents have full-time jobs that each earn at least $14 an hour. A single breadwinner in that same family of course would have to make at least $28 per hour. And that’s just to afford basic living needs, like housing, child care, transportation and medical bills. Yet Michigan’s job market is disproportionately made up of low-wage jobs — 62 percent of the state’s jobs in 2015 paid less than $20 per hour, according to new research on the state’s working poor to be released today by the Michigan Association of United Ways. Despite declining unemployment and rising wages over the early part of this decade, the share of Michigan residents either living in poverty or considered to be among the state’s working poor has remained stubbornly unchanged. Forty percent of Michigan’s 3.8 million households, or more than 1.5 million, either had incomes below the federal poverty level or didn’t earn enough to make ends meet in 2012 and 2015, the most recent data available, according to the report. The study focuses on this working-poor population that United Way researchers coined ALICE, for asset-limited, income-constrained but employed. A quarter of all Michigan households can be considered ALICE. That fraction remains the same since the United Way’s first ALICE report, issued in September 2014, even as households in poverty dipped slightly while the size of Michigan’s ALICE population grew slightly. The ALICE group earn too much to meet the federal definition of poverty, but not enough to afford some necessities. An unexpected car breakdown or doctor’s visit can lead to financial stress in an ALICE household, and create barriers to employment that ultimately can prevent someone from moving up the income ladder. While the updated data signal progress in moving people out of poverty, “we’re just getting started” on lifting the working poor into stability, said Nancy Lindman, interim CEO of the Michigan Association of United Ways. Today’s report updates the initial ALICE study to better reflect health insurance costs imposed by the federal Affordable Care Act, declining jobless rates and the push among some low-wage workers toward a living wage. Yet it also shows the challenges that remain with a state economy dominated by low-skill, low-wage jobs and increasingly trending toward automation and contract work. 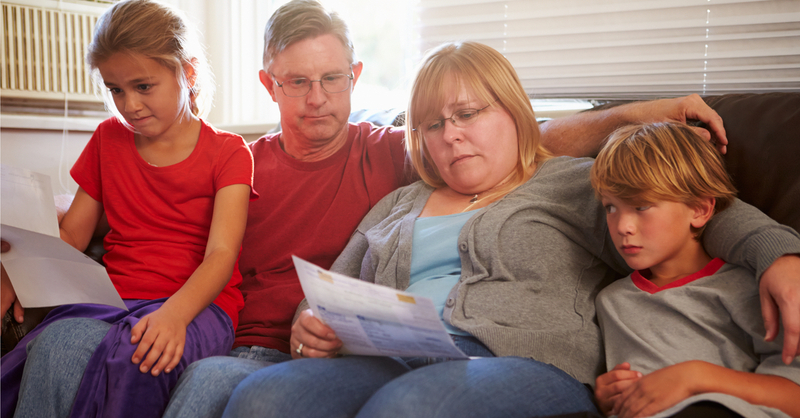 That four-person family in 2015 would need to earn $56,064 annually to afford basic necessities, the report shows. That is more than the $50,345 per year, or roughly $25 per hour, needed to afford the same basic needs in 2012. More striking, this new report found, this family would have to earn $98,457 a year to be considered financially stable in Michigan. Why the big jump? Stability, under the study, would add in the costs of a vehicle lease, higher-quality child care and housing, employer-provided health insurance coverage and a cell phone (In 2012, the financial stability level was pegged at $92,409). Child care is the largest monthly expense in what United Way researchers consider the “household survival budget” for a family with two kids. Child care alone is pegged at $1,108 per month. Health care costs were estimated at $702 per month in 2015, up from $514 in 2012. Some of that increase can be attributed to higher costs stemming from the federal health care law, while most is due to increased out-of-pocket expenses, United Way researchers found. Monthly health care costs included in the ALICE survival budget account for the tax penalty for not having coverage, known as a “shared responsibility payment,” which the Internal Revenue Service capped at $975 for a family in 2015. The report’s authors say ALICE workers are unable to afford even the lowest-premium insurance plans on the federal marketplace and often make too much money to be eligible for Medicaid. The economic fragility of Michigan’s working poor is also a problem for employers. National estimates have put the cost of turnover for a single employee at close to $3,400, when factoring in hiring and onboarding costs, lost productivity and increased overtime for employees who pick up extra work. In recent years, companies across Michigan have pooled resources to form so-called employer resource networks, which match eligible employees with caseworkers to help with child care, bus fare or carpools, utility shutoff assistance or other issues that affect their attendance and job performance. More employers across the state, particularly manufacturers and companies that employ lower-wage workers, have started to recognize that they can improve their bottom lines and reduce turnover by forming or joining such a network, said Duane Berger, who used to coordinate employer resource networks for Gov. Rick Snyder’s office and now works as a consultant with an employer network in southwestern Michigan. “With unemployment where it is right now — which is a good thing — it also means you’re employing the hardest-to-employ, and it makes it more difficult to hang on to them,” Berger said. The network is expected to include 12 companies by early April in Berrien, Cass and Van Buren counties, with all but one of them in manufacturing, Berger said. The 12th company is in the healthcare sector. In its first five months, the network held on to 47 of 52 employees referred by their employers to work with a coach, he said. The group is working on launching a low-interest loan program that will include courses in budgeting and financial literacy. It also helped another employee get a driver’s license, Berger said, asking him to form a carpool in return. That includes employers and government. The United Way association recommended a number of short- and long-term strategies that could help move more ALICE workers into financial stability. Employers could consider offering paid days off and flex time, help with transportation and the option to telecommute in the near term, the report proposes. Longer term, companies should consider offering higher wages and benefits, on-site health services, wellness incentives, mentoring and employer-provided training, apprenticeships and the opportunity to move into full-time work. The report says governments should consider such things as child care vouchers, housing subsidies, attracting higher-skilled jobs and offering job training or education assistance. While the report seems to focus on the revenue and expenses of an existing family, what is not mentioned is that the jobs themselves may be changing. At one time, it was not reasonable to pay a buggy whip maker more, as there was only a limited market for a number of buggy whips. The real question is how fast can people adapt to a changing jobs market. You're right, Jarrett. That is absurd. I always barely broke even, but made it with four kids and husband not working for many years, making much less than $100k per year. I didn't have money for extras, but could pay the bills. in Michigan since the depths of the recession, unemployment and underemployment remains high. And poverty is very common both in the UP and in the central part of the state north of Lansing. We need a frank discussion of the state's economic development strategies and our failing system for supporting local governments. We have the new report about the state's need for major educational changes. Is there a way to access an Excel file of the data used to draw the informative map? It has been a difficult economy for quite a while for lower income people. My question would be why are people having children if they cannot support them? I'm not talking about the workers who get displaced. Common sense has to come into play at some point. Your "common sense" solution that the working poor shouldn't have children was also promoted by the eugenics movement in the United States. The decision to have children shouldn't be a privilege of wealth. Not only is that dystopian and inhumane it isn't even practical (unless you are in favor of drastically increasing immigration). And here we find yet another reason why Obamacare is having the opposite (official) effect than what was intended. And yet another reason to scrap it! "The report says governments should consider such things as child care vouchers, housing subsidies, attracting higher-skilled jobs and offering job training or education assistance." Which would be paid for by??? All of those "solutions" require more tax revenue to fund them. There is no other option as clearly demonstrated by Gov. Snyder's successively growing budgets, state government has this thing about prioritizing its spending. So to "help" the people who don't have enough money as it is, one answer is to have the government to take more money from their paychecks (and when they shop, etc) in order to pay for it? I have read in numerous places that American's tendency to migrate to areas of greater and out of areas of lesser opportunity is at it's lowest point in history. As I travel about the areas mentioned, the UP and many areas of the northern LP, I often wonder what residents of working age do and how that works? Maybe rather than assistance a U-Haul voucher would be more productive? Wow! With such a simplistic one liner for a complex issue you are perfect for Lansing or even your local government. Let's watch you solve all of the issues in the state and then we can send you to Washington. Maybe you can advocate for forced sterilization as well since you assume that pay is commensurate with being stupid or smart and we sure don't want any of the dead beats breeding now do we? Relentless Positive Action. The MI GOP has been a disaster for Michiganders. Yah, the Granholm years were a paradise! Yes, I miss Granholm also. She was at the helm during some awful years for the economy. Michigan would have been in a much worse place than it is even now without her. As I read the article I was wondering is this article to inform about the plight of people or promote what other people should be doing. It opened with a family to set the topic, but then it left the people and focused on what others should be doing. We hear about people that ALICE is designed for, but we don’t hear about success. We don’t hear about how people lift themselves out of such situations, we don’t hear about how United Way efforts help people out of their situations, we don’t hear about how anyone is lifted out of such situations, and we hear nothing about how all the efforts described in the article lift people up. If there are no successes then what hope is there for the people in the ALICE situations, what hope is there for those people wanting to help others better their lives? If there is no success why should we believe any efforts mentioned in the article are worthy of support? I think we learn most from success, we learn it can be done, learn what and how individuals have done it, we learn when and how others can offer a ‘helping hand’ to people so they can lift themselves, we learn how we can be part of that ‘helping hand’ and see if we are being effective. But we learned nothing about success; we don’t even learn if success happens. The article became really discouraging when I read the last part of the article, for it made me wonder was this article about improving people’s ability to improve their situations or it was the first step in promoting new legislation to control employers. “Employers… paid days off and flex time, help with transportation and the option to telecommute in the near term...Longer term, companies should… higher wages and benefits, on-site health services, wellness incentives, mentoring and employer-provided training, apprenticeships and the opportunity to move into full-time work.” And there was no mention how all this would help employers be more competitive, would help them survive to continue to employ people. With all of this added cost to employers has anyone considered the unintended consequences of fewer employers? The United Way report says, "Employers could consider offering paid days off and flex time, help with transportation and the option to telecommute.." and " companies should consider offering higher wages and benefits, on-site health services, wellness incentives, mentoring and employer-provided training, apprenticeships and the opportunity to move into full-time work." What if the employer's customers aren't willing to pay for those things? Then what? Where does the employer get the money to pay for them? The employees basic problem is that their contribution to society is not sufficient for them to earn more. A person I know lived downstate and was paying $1125 per month for rent 5 years ago. Daycare for 2 children would be $ 2000 per month at a center. Do the math. They chose to move. Now that person is paying $1000 per month for health insurance with $6000 deductible for each family member. Two people almost always have to work. Love to hear comments. A persistent problem for Michigan's population is it's low educational attainment levels. Many of the jobs that at one time made Michigan a "wealthy" state have been eliminated or automated, leaving lower paying, low skill jobs. If Michigan is to be a serious player in the global economy--no matter what the current nationalist White House does--let alone a competitive region in the national economy, educational attainment and state educational policy needs to change. Unfortunately, Lansing has not shown much initiative or creativity on the policy front, in spite of being a state with a fairly remarkable higher education system that includes world class research institutions. In addition, the state has a major industry that is at the forefront of a wide array of technological innovation, requiring highly skilled and educated workers, together with ancillary high skilled and educated occupations in both the industrial sector and service sectors. Fixing the persistent failure of Michigan's population to increase their own educational attainment, perhaps based on misguided notions of rich manufacturing jobs, will require a huge attitudinal change among Michigan's population and policymakers. That hasn't happened, in spite of substantial economic analysis supporting it, and Michigan has continued to lose status and rank as a wealthy state, approaching the economic status of states in the Deep South.